If you’re planning a road trip or flying with young or elementary age children, you are probably thinking about ways to keep them busy during the long hours. A DIY kids’ travel binder is a great way to provide fun activities and free printable travel games that will keep your children occupied for hours. You don’t have to be crafty or special supplies; a travel activity binder for children is easy to make! I have four children and we’ll be heading out on a long road trip to North Carolina to visit Grandma and Grandpa soon. It’s over 800 miles away from our home in New Hampshire and we’ll be on the road for a good 15 hours or more. This is far from our first long road trip with the kids before – we’ve had some great trips and others that were honestly terrible, so I have a few tricks up my sleeve. This year, I made a kids’ travel binder for each of my children. It’s simple, yet cool and filled with fun road trip activities and printables that will keep them busy and happy. A DIY kids’ travel binder is easy to make (no “craftiness” required) and the best part is you can add whatever activities you’d like. Plus can reuse it again and again for future trips! I’ll show you how to add an attached marker and holder so your kids won’t lose their markers in the dark crevices of your vehicle! You’ll also find a huge list of free printable road trip games and activities from more awesome bloggers and sites below. I made a free printable cover for your kids’ travel binder. If you choose, you can upload it to a photo editing site, like PicMonkey, and add your child’s name to make it fancier. Or you can just hand write it. Insert this cover into the front of the binder. Now we’ll make the simple holder for your child’s marker. Cut off a 2-3 inch section of the decorated duct tape. Cut a small 3/4-1″ section of tape and add to the middle of the long piece’s sticky side. Do this again for a second piece. Using the dry erase marker as a guide, attach the tape to the middle top of your child’s travel kit binder. Add two pieces of tape to the sides – this adds extra strength to the marker holder. Tie one piece to the top of the dry erase marker. Hot glue this in place. Tape the other end of craft cord to the marker holder. And you’re done with the attached marker and holder for your travel kit! The free printable map activity is my favorite part of this kids’ travel kit binder. It’s perfect for elementary-aged kids on up because they can follow along as you travel. It’s a great way to teach kids how to read maps in this age of GPS too! Plus you’ll hear far less “Are we there yet?” with this simple addition. I plan on including destination maps in my younger children’s binders too (Joshua (age 6) and Luke (4)) because I know they’ll still enjoy it. Kids can trace the route with the attached dry erase marker and they’ll love seeing the progress you’re making. I recommend going a step farther and plan out your route including stops so your kids can see exactly how far between stops. Go to Google Maps or some other map program and map out your route and stops. Then save and print out pages, depending on how long your trip. Our trip has 5 pages for each way – 5 for traveling to Grandma and Grandpa’s house and 5 for traveling home. I uploaded each page to PicMonkey and added stars to mark where our stops with a big star for our destination. This simple activity alone will make your trip easier! Last, but not least, print out activities for each of your children, depending on their ages. There are tons of free printable activities for kids out there. Here’s just a few that we found and will be using. 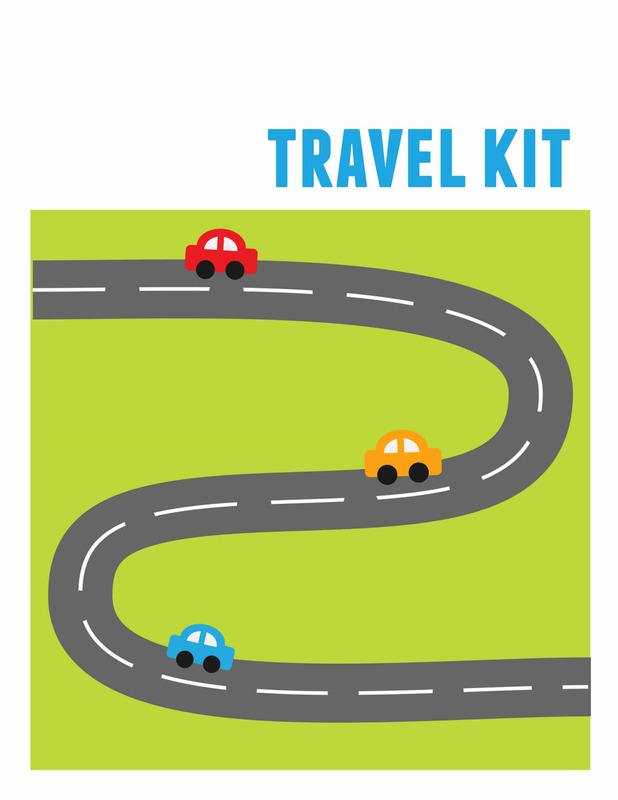 50+ Travel Games and Printables – a HUGE selection of activities, including fun facts for each state, bingo games, drawing tutorials, mazes, matching games and more. 2 Road Trip Printables – word search, mazes, tic tac toe, and a great “All About My Trip” printable to fill out on the way home! 13+ Free Printable Car Games & Activities – bingo, lines and dots, tic tac toe, scavenger hunt, battleship, sing along songs, string game instructions, license plate games, travel tickets (for good behavior), a “how much farther” idea, and more! 4 Free Printable Drawing Prompts – these are so cute and great for kids of any age! 7 Road Trip Activity Pack – scavenger hunt, story starters, I Spy, bingo, great number race, how many do you see? Your kids might also love this super easy-to-make DIY Travel Coloring Kit! This handy travel binder can’t make the miles disappear, but it can help make the trip go faster and smoother for the whole family! This is a great way to keep the kids entertained in the car. I remember how bored I always got on road trips growing up. Such a great idea. We used to buy coloring books for trips, but I like your idea better because it is personalized for the route! I love this idea! We’ve started a no tech in the car rule with our grandkids. It had gotten to the point where they fought over an iPad during the less than 10 minute drive from our house to theirs. I think a version of your travel binder will be fabulous even on our short everyday car rides! Using the map for the route you’re taking is a great idea! I’ve never seen anyone do that before. I love this and would not only be using it for travel but for local trips as well. As it would keep kids entertained no matter where you are going. Plus if you end up somewhere and have to wait for any amount of time they could bring it in with them to work on. So I would like to thank you for taking the time to share it with us. Can you please elaborate more on how you printed the map? I am trying to put a binder together for our family vacation and I cant figure out how to get as nice of a map as you have! Hi Erika! I am a travel agent and have a blog. I linked back to your site for an entry I was doing about travel binders. I included your site as one to check out for tips and forms. I hope that’s ok!